The campaign on the Referendum about our membership of the European Union saw debate in the United Kingdom plumb depths it has not previously reached in your author’s 40 years of active involvement in politics. What’s more, it leaves the Leaders of the two largest Parliamentary Parties cut adrift from the support of a significant number of their Members of Parliament. The Remain campaign, its reckless scaremongering damaging both the reputation of the Prime Minister and our stock market and currency, treated the electorate like simpletons, with insulting contempt for their concerns and fears. The blatant threat of a punishment beating for the retired by reducing their pensions should they dare to vote Leave was a disgraceful, cowardly and under-hand tactic that had no place in our national discourse and can only have reduced still further the stature of both David Cameron and his Chancellor, George Osborne, in the eyes of the 80% of their Conservative grassroots activists who wanted us out of the European Union. And the knee-capping of hard-working families promised through significant tax rises in an Emergency Brexit Budget was a direct attack on the very people who put the Conservatives into office with a working majority in the House of Commons. This column has always been clear that it supported our withdrawal from the European Union, but it has also been consistent that such a view was based upon the need to restore sovereignty to our Westminster Parliament which has been emasculated by the European Union, and by a considered view that our nation’s economic prospects are better, far better by rapidly developing trading links with the world outside the over-regulated, under-performing economy of the EU and its vulnerable single currency. What this column has consistently railed against is the virus of xenophobia with which Ukip infected the political life of this country by its irresponsible and, frankly, on occasion repugnant denigration of those who come to our country from overseas to work, to build lives for their families, taking the lowest paid jobs and keeping our public services going. That Government has not provided the infrastructure to cope is a failure of national policy, not a fault of those who come here. Successive Governments have consistently failed to deliver the new schools, hospitals and houses that have been so obviously required for decades. For many it was necessary for noses to be held against the repugnant odours of borderline racism of some elements of the Leave campaign propaganda and messages. 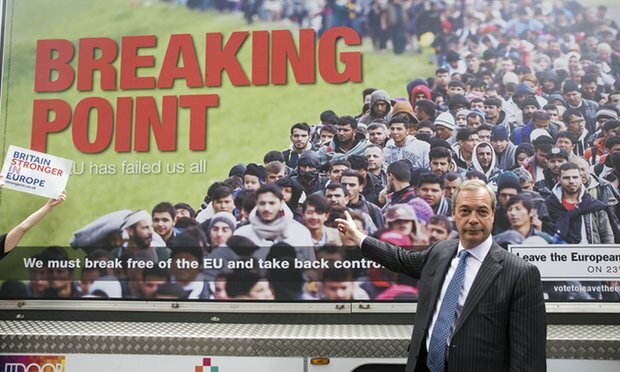 Our political leaders on both sides of this debate took leave of their senses and allowed the genie of racism out of the bottle, insulted and belittled each other, scoffed at the intelligence of the electorate, demonised migrants, damaged our international reputation and divided our nation. This column hopes we never have to witness such a disgraceful political spectacle again. Like the Labour Leader, Jeremy Corbyn, adrift from many of his own MPs, David Cameron now lacks the support of a good chunk of his Conservative Parliamentary Party and the respect of the majority of his grassroots activists. Where does he go from here, and when, will be a question for political commentators. As importantly, where will the Conservative voters go, and was the splitting of the Party’s broad coalition of support a price worth paying when David Cameron called the referendum to deliver temporary party unity in the run-up to the last General Election? Both Labour and Conservatives are in uncharted waters with no precedents that can be drawn upon to predict what happens next, but politics is certainly going to be interesting as the electorate increasingly reconsiders its allegiances and priorities. We should also take a moment to pause and reflect on the murder of Jo Cox, a serving Member of Parliament, going peacefully about the business of seeking to meet, have a dialogue with, and assist her constituents. We should extend to her family and her friends our deepest condolences. It is right that the main political parties will not contest the by-election to replace her and that the Labour candidate will be elected without substantive opposition. That is a glimmer of hope, that our politicians can put the division and impoverished dialogue of the deaf that has been the referendum campaign behind them, and act, all of them, in a dignified, sensitive and respectful way. We will need to nurture that glowing ember of British decency if the divisions of the Referendum are to be successfully healed. But, let’s end speculation about any possible political motive deriving from the Leave campaign as the cause of this brutal murder. What we saw here was the clash of two forces, one for good and one for bad. For the good, we pride ourselves as a nation, quite rightly, on the accessibility of our elected politicians and their openness, indeed determination in most cases, to meet personally with their local voters. For all the talk of security reviews and updating advice, most politicians will want to keep security out of their surgeries and avoid the erection of barriers between them and their communities. The force for bad is the failure of successive Governments properly to invest in the provision of resources, including training, for the identification and treatment of mental health. This column has consistently called for a greater priority to be attached to an area of wellbeing that is so important to so many people and which remains the poor relation within our National Health Service and social care services. As a nation, we failed not only Jo Cox and her family, but also it seems the perpetrator of the crime who was mentally unwell and had sought treatment only for it to be delayed. It would be a fitting tribute to Jo Cox were our major political parties to come together on mental health to move it further up the political agenda and to give it the resources and the priority it needs. Cllr Chris Whitehouse KSG is Chairman of Westminster’s leading political consultancy, www.whitehouseconsulting.co.uk, Secretary of the Catholic Legislators’ Network, a Trustee of the Right To Life Charitable Trust, and a Member of the Isle of Wight Council (Cons. Newport West).